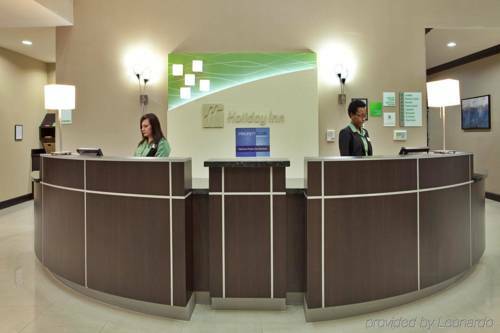 Guests can enjoy the unique culture and charm of a historic Louisiana city when they stay at the Holiday Inn Hammond. Hammond is located at the intersection of I-12 and I-55, placing both Baton Rouge and New Orleans within easy reach. This hotel's prime location is convenient for both business and leisure travelers. Architecture enthusiasts can venture downtown to Hammond's Historic District and take in the weathered brick buildings and local shops. History buffs can visit the Tangipahoa African American Heritage Museum, a stop on the Louisiana African American Heritage Trail. Hammond is also minutes away from the quaint town of Ponchatoula, known for antiques as well as the 'Strawberry Capital of the World'. Golfers can enjoy the sculpted greens at the nearby Carter Plantation golf course. North Oaks Health System is just minutes away, as is the campus of Southeastern Louisiana University. Corporate travelers can easily take advantage of the 3,000 square feet of meeting space and close proximity to many local businesses. Guests can relax in the Lounge and enjoy local cuisine at the hotel's on-site restaurant, while still staying in shape in the 24-hour Fitness Center. Complimentary high-speed wireless Internet access is also available for all of our patrons. Call today for reservations! Country ClubCountry club offers 18 holes of golf.